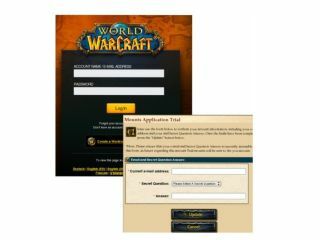 Hackers have once again targeted World of Warcraft players with a phishing scam – sending out an email invitation to a free trial of mounts that encourages people to part with their precious login details. Cybercriminals can make money by flogging off gold and possessions that are earned in the game – which makes phishing for logins especially lucrative. The latest scam, as reported by Sophos' Graham Cluley's on the Dark Reading blog, revolves around a well set up fake site that users are urged by email to visit and put their information in. 'Why would anyone do that?' We hear you cry. Well, because the email offers the person a sneak peak at 'mounts for the game – the horses, gryphon and other mystical creatures that can whiz you around Azeroth faster. "Emails intercepted by researchers at SophosLabs, pose as official communications from World of Warcraft developer Blizzard Entertainment but are really intended to lead players to a phishing website," explains Cluley. "Game players would be wise to remember that if something sounds too good to be true (free gold, free weapons, free expansions), it invariably is too good to be true."